This advice rings true in many ways for us all, especially during this time of year when many of us naturally shift our focus from the grind of work and school to family and faith during the holiday season…quickly to be followed by the new year’s resolutions and promises soon to be made for changes in 2018. While this cycle of time and place habitually plays out for us throughout the year, it hasn’t always played out much in modern politics. It seems the same political fights and debates never end or resolve much anymore. We have all heard of the “old days” where politics was allegedly less personal and divisive and supposed “compromise” was much easier to find. Tales of Ronald Reagan and Tip O’Neill having a beer together at the end of a long day of fighting or folks like John Breaux or Bob Livingston often crossing party lines are usually referenced. The perception today is the election cycle never ends and many politicians are consumed with talking more about their disdain for a political opponent or the next office they plan to run for as compared to spending their time crafting solutions to our mounting problems. This week, tax reform legislation was signed into law by the President that will lower rates for individuals and businesses across the country and bring tremendous investment back to our shores, a significant political and economic achievement. Sadly, it passed with hardly any Democrat support whatsoever. In fact, in the beginning stages of this effort, the Senate Democratic Congressional leadership refused to even meet with the President to discuss tax cuts, much less have a beer together after a long day of fighting. 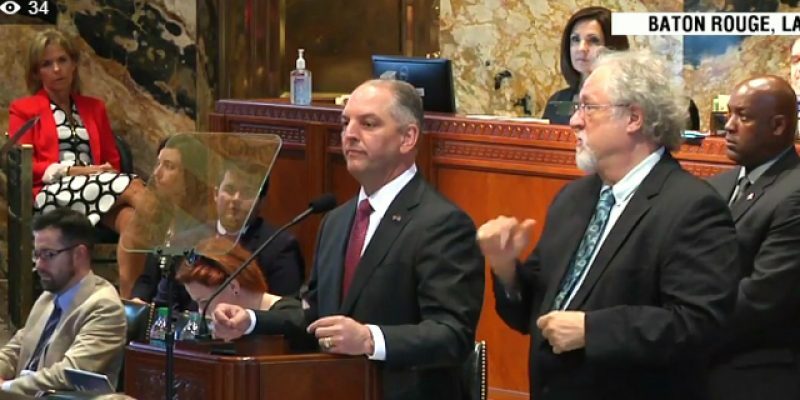 Back at home in Louisiana, the Governor unveiled his plan to address the upcoming fiscal cliff and his desire to call a special session to enact new taxes in February. The specific policies included in his tax plan did not dominate his remarks nearly as much as his personal disdain for the efforts to date by the House Republican Leadership. Not exactly a harmonious kickoff to the 2018 version of tax and spending debates. Essentially, his proposal would do away with the 5th penny of sales tax passed in 2016 and replace those taxes with a combination of tax increases on personal income, corporate income, small business income and a host of transactions that would now be subject to new sales taxes. Specific details on some of these items were not released. For instance, on the expansion of sales taxes to new transactions, the Governor made it clear he wants to raise the utility tax on industrial businesses by 2% and small businesses by 4%. He also plans to tax manufacturing machinery and equipment (known as MM&E), but he did not specify who explicitly would be subject to this tax. The details on these points are controversial and critical since these new taxes on business inputs come at an especially precarious time in Louisiana’s economy. On the expansion of sales tax to other services, which services are to be taxed under his new proposal? Are accountants, lawyers, landscapers, farmers and barbers all in or are some exempted? With the proposed income tax increases, will a reduction in tax rates be included in the plan or will all the dollars collected just go to more government spending? In D.C., the tax reform that became law last week used credits, rebates and exemptions to pay for lowering tax rates. Will the Governor’s plan incorporate any of that philosophy as well? Another important question is whether any part of the Governor’s plan is to reform or reduce the size and scope of government? Are any spending cuts proposed? Any reforms to inefficient or outdated programs? Any reform-minded policy changes such as centralized collection, fiscal transparency, spending caps, agency reductions, Medicaid reform, pension reform, the elimination of unnecessary boards and commissions or the undedicating of certain funds? Many details in the Governor’s latest tax plan are yet to be seen and those details must come out soon. The Governor has given the House until January 19th to take his proposal or offer their own. For that decision to be an informed and reasoned one, much more specific information is needed from the administration. The time is now for members of the Legislature, whether they are Democrat or Republican, to work together and thoughtfully consider the Governor’s latest tax proposal. The Governor should release the bills he plans to offer to implement his plan well before the January 19th deadline. The Legislature should share these bills with the public and even hold public hearings on the impact of each bill so a balanced, thoughtful decision can be made. There is a time for politics but that time is not now. This is no time to rush into a bad decision. This is simply a time for a thoughtful public debate of the specifics within the Governor’s tax plan.